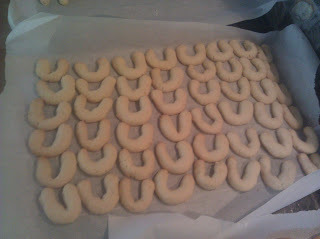 Cooking, Cronk, and Two Crazy Dogs: Vanilla Kipfels - My Favorite Christmas Cookie! Vanilla Kipfels - My Favorite Christmas Cookie! This recipe came from my Grandmother who grew up in Austria. 1. In a food processor or blender, process almonds until they are finely ground. 2. With an electric mixer, cream the butter, shortening, and sugars together until the mixture is light and fluffy, about 3-4 minutes. 3. Add the egg, yolk, and vanilla extract. Mix for 1 minute. 4. Gradually add the flour and almonds. Mix well blended and no flour is visible. 5. Preheat the oven to 375F. 6. Using your hands, pinch off small balls of dough (about 1 in in diameter). Roll the ball between your hands until you form a 3-inch log, then form a "U" shape with the log. Place on a parchment-lined baking sheet about 1/4 inch apart. 7. Bake for 12-15 minutes, until the edges are lightly browned. 8. Let cool, then roll the cookies in the sugar/vanilla sugar mixture. DIY Peanut Butter - Roast, Grind, and Eat!